For the Tails' Skypatrol level, see Rail Canyon (Tails' Skypatrol). 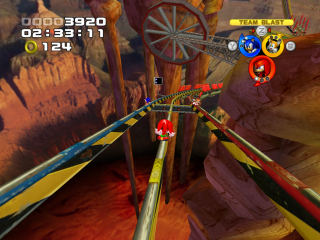 Rail Canyon is the seventh level of Sonic Heroes. Eggman has made his base amidst the spires and plateaux of this Grand-Canyon-dwarfing ravine, and his diabolical machines shunt to and fro above the yawning void on tenuous, wiggly rails. As such, this is a level mostly spent grinding, in the same vein as Sonic Adventure 2's Final Rush. Gimmicks on this stage include light-rails which can be changed from blue to red via switches, opening up new routes. The Teams share the tracks with Rhino Liners, as well as large red/back traincars that resemble demonic caterpillars. While Amy's been driving Team Rose forward up until now, it is Big and Cheese who push to advance into Rail Canyon, respectively reporting to sense Froggy and Chocola nearby. Team Sonic races towards their three-day deadline to find Eggman, determined to reach Bullet Station at the end of the canyon before sundown; Team Chaotix has simply been ordered to infiltrate the terminal station, making their objective the same. Lastly, "Eggman"'s cryptic words in Robot Carnival have disturbed Shadow, so he is determined that Team Dark must capture and interrogate the Doctor. 35,000 30,000 25,000 20,000 <20,000 Head for the terminal station! 45,000 40,000 35,000 30,000 <30,000 Find the entrance to Eggman's base! 38,000 36,000 32,000 28,000 <28,000 Go beyond the rails! 32,000 28,000 24,000 20,000 <20,000 Infiltrate the terminal station! 35,000 30,000 25,000 20,000 <20,000 Get to the Goal Ring within 5 minutes! 10:30 11:00 11:30 12:30 >12:30 Defeat 100 enemies! 4:00 4:30 5:00 5:30 >6:30 Collect 200 rings! 34,000 32,000 30,000 25,000 <25,000 Infiltrate the terminal station within 6 minutes! This page was last edited on 3 March 2018, at 16:56.